An evolution of the 2016 QX Sport Inspiration, the QX50 Concept shows how the design of its conceptual forebear could be adapted for a future production model in the world’s fastest-growing vehicle segment. It features a ‘cabin-forward’ silhouette combined with ‘taut, muscular lines and flowing surfaces’, says Infiniti. The QX50 Concept also previews the brand’s roll-out of its autonomous drive support technologies which will act as a ‘co-pilot’ for the driver, empowering rather than replacing them, and ‘delegate’ more onerous driving tasks to the car – such as navigating stop-start traffic on the highway or keeping track of the positions of surrounding vehicles. This ties in with Infiniti’s core strategy for all future autonomous drive support systems: that they should ensure the driver retains ultimate control over their vehicle while providing a proactive approach to safety. 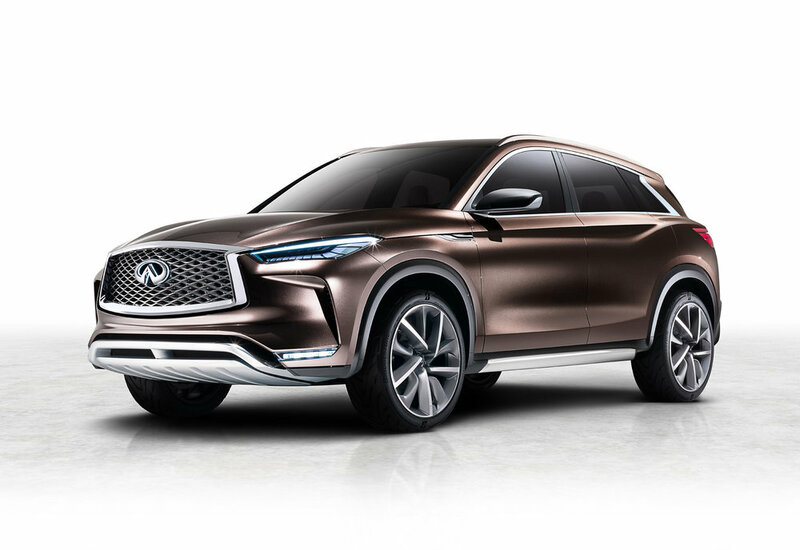 The QX50 Concept’s autonomous drive support systems preview the first production-ready incarnation of a technology package that will be developed further in future production models. Detroit will also see Infiniti exhibit its new VC-Turbo (Variable Compression Turbo) engine – the world’s first of its kind in production-ready form – which combines the power of a high-performance 2.0-litre turbo petrol engine with the torque and efficiency of an advanced diesel powertrain. Using an innovative multi-link system, the VC-Turbo engine is able to seamlessly raise or lower the reach of the pistons, instantly selecting the most suitable compression ratio – between 8:1 (for high performance) and 14:1 (for high efficiency) – for the prevailing driving conditions. With a development target power output of approximately 268 hp and 390 Nm torque, the VC-Turbo engine will be comparable to certain six-cylinder petrol powertrains for performance, while outperforming them in efficiency with Infiniti engineers targeting a 27% improvement in fuel efficiency over V6 petrol engines of similar power output. The Infiniti QX50 Concept will be unveiled at the North American International Auto Show (NAIAS) which is taking place in Detroit from 8 to 22 January, 2017.